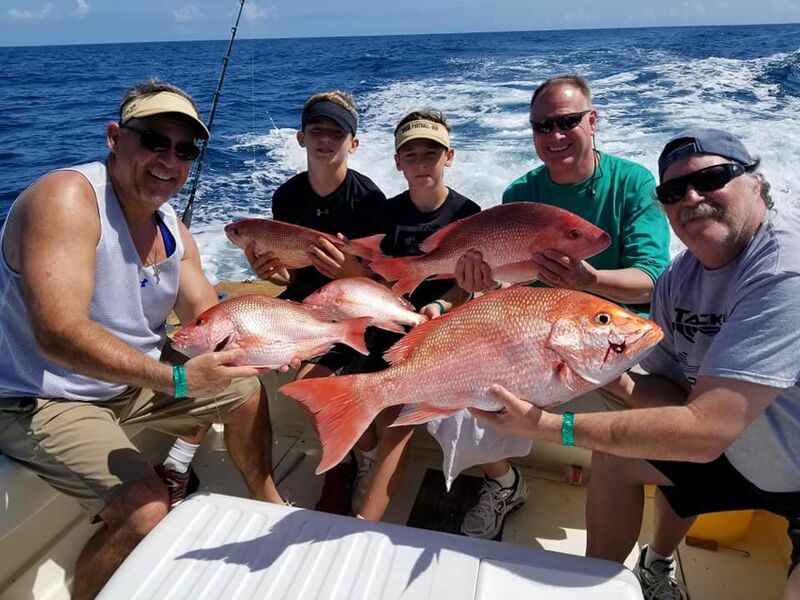 Bryan Ray/Courtesy PhotoThis photo from Captain Bryan Ray Fishing Adventures of South Padre Island shows a fishing party May 23 with freshly caught red snapper. The smaller of the fish were produced locally by the new RGV Reef, which dumped its first load of concrete materials offshore last summer. RGV Reef, an artificial reefing project to dramatically increase red snapper and other fish populations off South Padre Island, has gotten a big boost of its own from a major pipeline company. is nearing completion of a $1.5 billion natural gas pipeline running through the Lower Rio Grande Valley. Cameron County Precinct 1 Commissioner Sofia Benavides, who was among the many elected officials and local leaders attending the ceremony, was responsible for getting the two sides together. “When Valley Crossing first came, probably about 18 months ago, they wanted me to know about what they were doing in the area, and also they were looking to give back to the community,” she said. One day, VCP representatives happened to be in her office the same time as Friends of RGV Reef Vice President Daniel Bryant, Benavides said. RGV Reef is 1,650 acres of self-sustaining, artificial reef composed of high, medium and low-relief elements designed to provide habitat for fish from the juvenile stage through adulthood. So far, it includes 4,000 tons of concrete materials of various sizes and two sunken vessels. The reef is located eight nautical miles off the coast and 14 nautical miles north of the Brazos Santiago Pass jetties. Bryant has been spearheading the project along with “Friends” president Gary Glick and treasurer Bob Glick. The Harte institute provides guidance through research by marine biologists and students who monitor development of the reef and fish populations. The first deployment of material took place last summer and over winter saved an estimated 240,000 juvenile red snapper, most of which would have been eaten by predators otherwise, since the Gulf seafloor is devoid of places for young fish to hide. He said part of the VCP donation will be used to pay for transport of enough concrete railroad ties to the reef to build a 45-foot-tall pile of ties extending into the “photic zone,” the layer of water that receives sunlight. “The biologists tell us that it will have an almost constant ongoing ‘knuckle’ in the current that will bring nutrients up into the photic zone, where plankton will eat them, and sardines will eat the plankton, and the fish will come to eat the sardines,” Glick said. “It will be a focal point for all of those fish that we love to catch. Initially it was thought RGV Reef would take decades to complete and tens of millions of dollars to fill, he said. Because of donations of money, reefing material, storage space, and time and labor from many quarters, the project is being accomplished much more quickly and at about a 1/10th of the cost of a typical reefing contract, Glick said. Larry McKinney, director of the Harte institute, said sport fishing in the Gulf of Mexico is a $1.6 billion-per-year industry and that he’s happy to be part of the project, which McKinney noted is “based on sound science.” A well-documented study on RGV Reef estimates an annual economic impact of $6 million, said Glick, who praised Benavides for making the VCP connection. Benavides pointed to the economic aspect of bringing more people and money to the Island by putting more fish in the water. “Why wouldn’t we want to invest in a project of this magnitude?” she said.